Welcome to your new social circle! B.Social was established in August 2015, with the director’s idea to create a venue where simply ‘everybody’ was welcome. B.Social is about communal eating, shared platters, wood oven pizzas and Italian cooking, all fused together to create memorable moments. Tickets only $5.00 each. Do you have yours? Every restaurant transaction of $60-$100 will give you 1 FREE ticket into the draw. For each single transaction over $100, you receive 3 free tickets into the draw. The 3 draws have a total prize pool of $531!! 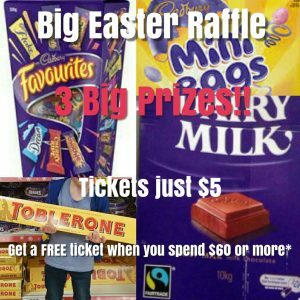 (1x10kg Toblerone with mini eggs, valued a $146, 1x5kg Favourites with mini eggs valued at $175 & 1x10kg milk chocolate valued at $210. Each entry will need to provide their full name, mobile number and email address to be entered into the draw. All information will be kept with B.Social and used for marketing purposes. You can cancel this at any time. Your details will not be shared. The draw is open to customers who buy tickets from January 20th to April 10th 2019. The draw will take place at B.Social on 11th April at 8.30pm.